Recently voted the happiest place on the earth, Vanuatu truly does live up to its name. It is one of the safest countries in the Pacific and strives to develop and grow whilst still retaining its culture and traditions. By walking down the street of the capital city Port Vila , you will see the contrast of westernization with its modern buildings and exotic restaurants amongst the traditional island lifestyle of locals, a thriving market place, nakamals and string band singing on the streets. You will find that you will never be disappointed with whatever choice of accommodation you choose to have. The sunniest places and the best all inclusive resorts on sale at expedia.com. From a real island experience with no electricity and modern amenities to a luxury five star resort, Vanuatu is guaranteed to cater to your budget and lifestyle. Tourism is Vanuatu's main industry and is the destination for most of the southern hemisphere cruises, whose passengers delight in the genuinely happy and friendly people. It is highly recommended for visiters to visit Vanuatu by Cruise ships, with magnificent views of beauty why not Cruise in the Pacific Islands? 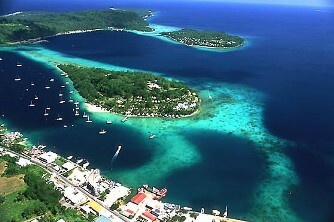 Come rejuvenate, relax, enjoy and experience delightful Vanuatu ! This site is about the happiest place in the world, Vanuatu. Check it out for information about accommodation, places to eat and things to do!